Pictured below is a controller we recently made for use in a poultry egg incubator, designed to keep eggs within a very narrow specific temperature and humidity range for a few weeks. This is achieved using a heater, a fan, and a humidifier. The eggs need to be turned at least three times per day every day except for the last few days before hatching. Previously we made a Controller for Poultry Incubator which had a motor which was turned on and off at different times of the day to turn the eggs. For this new incubator, the motor used is a very slow turning 12 VAC device makes 6 full rotations every 24 hours. That motor therefore did not need to be controlled with a timer – it is just left running at all times. The display for this controller shows the current measured temperature from the waterproof DS18B20 digital temperature sensor (read at 12 bit resolution = 0.0625°C resolution), and the humidity from a DHT11 sensor (within 5% accuracy). The DHT11 actually has a built in thermistor, but its temperature measurements are nowhere nearly accurate enough for this type of project. 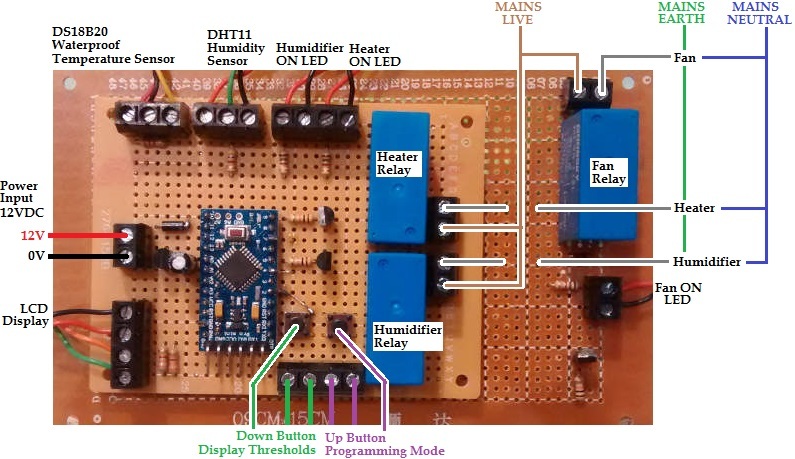 The bottom line of the display shows the three devices being controlled – heater, fan, and humidifier respectively. In the image above, the heater is marked as being on. If the humidity level gets too low, the humidifier will be switched on. If the temperature gets too hot, the fan will turn on (and of course the heater will already be turned off by then). The user has full control over the thresholds at which the heater, fan, and humidifier will turn on and turn off. The temperature thresholds for the heater and fan can be set in steps of 0.2°C, and the humidity thresholds in steps of 2%. For example, the heater could be set to turn on at or below 36.4°C and off again at or above 38.4°C. Then the fan could be set to turn on at or above 38.6°C and off again at or below 37.4°C. Humidity should ideally be around 60% (raising to 65% just before hatching), so the humidifier could be set to turn on at or below 56% and off again at or above 64% relative humidity. With all the thresholds programmed in by the user according to the requirements of the particular type of eggs to be incubated, a button can be pressed to show in turn the values programmed in – for example, above the humidifier is shown to be set to turn on at or below 43% RH and turn off at or above 70% RH. If you need any kind of egg incubator controller (or the electronics for a temperature and humidity controlled humidor – functionally pretty much identical to an incubator!) – please email neil@reuk.co.uk with details of your specific requirements.